Corn or maize oil is extracted from corn germ, which is the oil-bearing part of the kernel, and its primary use is for cooking. Corn oil is also an essential ingredient in margarine and other processed foods. It is also a source of biodiesel and has several industrial uses. No wonder corn oil has become so popular in the world, especially in the United States. Corn oil is less expensive compared to other vegetable oils. But is corn oil healthy? Corn oil is a polyunsaturated vegetable oil that can create oxidized cholesterol and damage your health. The oxidized cholesterol increases your risk of coronary heart disease. Corn oil also has very high amounts of omega-6 fats, which put into disarray the omega-6 to omega-3 ratio in your body. The ratio should ideally be 1:1, but corn oil has a high ratio of omega-6 to omega-3 that, in turn, makes you more likely to suffer from many degenerative diseases. Corn oil does not have any carbohydrates, proteins, or minerals in it. It contains very few vitamins, apart from vitamins E and K, which makes it less healthy for human consumption. It contains 13.6 g of fat as well as a high ratio of omega-6 to omega-3, which we’ve noted increases the risk of degenerative diseases. Corn itself does contain some fat, but the fat is healthy monounsaturated fat. There are no saturated or trans fats in corn, which means the small amount of fat found in corn is healthy for the heart. But if you add butter or margarine to your corn, the fat content will increase notably. Corn contains polyunsaturated fats as well, but like monounsaturated fat, this type of plant-based fat is healthy for the heart. The amount of fat found in corn overall is quite low. You can even have canned corn, as most types contain only 17% fat, which is not considered to be fattening. According to the American Heart Association, unsaturated fats may lower levels of “bad” LDL cholesterol. The composition of corn oil, on the other hand, is thought to be 12.7% monounsaturated fats, 58.7% polyunsaturated fats , and 24.2% saturated fats. This is because it is made from the fat-rich corn germ rather than the whole corn. Can You Use Corn Oil for Deep-Frying? Corn oil has a high smoke point of 450 degrees F, which makes corn oil good for frying. It’s commonly used in fast food chains. In fact, almost 70% of fast food restaurants make French fries with corn oil. However, the oil is high in saturated fats and low in healthy fats, which is why corn oil is considered by many to be one of the most unhealthy cooking oils. Corn oil is considered suitable for deep-frying but unsuitable for drizzling and low-heat cooking. Corn oil contains phytosterols in significant amounts. Phytosterols are sterol compounds that are derived from plant sources and are similar to cholesterol in structure. Many plant sterols lead to reduced absorption of cholesterol. In a 2002 study, published in the American Journal of Nutrition, participants were fed a diet rich in cholesterol. There was much higher cholesterol absorption following the consumption of corn oil from which sterols had been removed. When the corn oil phytosterols were added back to the sterol-free corn oil, the cholesterol absorption was reduced. This suggests that consuming corn oil can lower cholesterol levels. Corn oil is good for the cardiovascular system, if consumed in moderate amounts. It is rich in polyunsaturated fatty acids (PUFAs) like linoleic acids. Experts recommend getting about eight percent to 10% of your total calories from PUFAs for good heart health. The average person’s diet usually contains only about five percent, even with a high fat intake. A diet rich in foods that contain PUFAs, like corn oil, may help boost heart health. You can apply corn oil on your skin like any massage oil. It is a moisturizing agent, though not as effective as massage oils like olive, coconut, or sweet almond oils. The linoleic acid and vitamin E contribute to its skin-softening effects. Corn oil is a gentle oil, and you can use it as a base oil for lip balms, salves, creams, and night oils. Corn oil is about 59% linoleic acid; therefore, it is quickly absorbed into the skin. People are increasingly using corn oil for skin these days. Flavonoids and antioxidants such as lutein in corn oil can reduce free radical activity in the body. Lutein has been linked to improved vision health and the prevention of cataracts. Consuming polyunsaturated fatty acids can help lower high blood pressure in people who are suffering from hypertension. Corn oil contains these fatty acids, which give it the potential ability to lower blood pressure levels. A study published in Hypertension journal in 1989 examined spontaneously hypertensive rats fed corn oil. Researchers found that supplementing the diet with calcium led to a small decrease in blood pressure. However, you should consume fats in moderation, no matter how healthy and fit you are. If you are allergic to corn, consumption of corn oil can also lead to allergy symptoms like skin rashes, vomiting, and swollen mucous membranes, among others. Some also suffer from asthma attacks and anaphylaxis after consuming corn oil, primarily due to the ingestible protein present in the corn. The ratio of omega-6 to omega-3 in corn oil is highly imbalanced, and corn oil still very high in fat. Keep in mind that over 20% of your daily fat allowance can be found in just one tablespoon. Cholesterol problems may arise in those who consume the oil in excessive amounts, especially those who are already grappling with cardiovascular problems. Several studies indicate that there is a link between excessive levels of omega-6 fatty acid and increased levels of prostate cancer. So, again, moderation is key. Many brands of corn oil have been genetically modified to provide resistance to herbicides and pesticides. Research material published in the International Journal of Biological Science in 2009 reported that consumption of genetically modified corn causes toxicity of the liver in rats. The research demonstrated that the level of toxicity is often dose-dependent, which means that as consumption of genetically modified corn increases, the level of toxicity increases. In a large bowl, combine the corn, chiles, cream, butter, and eggs and stir until well blended. Add in the cornmeal and flour to make a soft but rich batter. Heat a large, nonstick skillet over medium heat. Lightly coat the skillet with corn oil. Drop one-fourth cup of the batter into the skillet. Add a few more drops, then flatten them to three-and-a-half-inch rounds. Let cook for about four minutes, turning once, until they are brown and set. Continue making cakes but keep adding a little oil before each batch. Take a large bowl, and mix in the cornmeal, baking powder, and fine salt. In another bowl, combine the egg and water. Add to the dry ingredients and mix until smooth. Add the okra, jalapeño, and garlic. Stir to combine. The batter should be thick and wet. To fry the griddle cakes, heat the oil in a cast-iron skillet over medium heat. Drop one-fourth cup of batter into the heated skillet, pressing it into an even layer. Add a few more drops of batter. Cook the cakes until the bottoms are brown and the tops and edges begin to bubble, for two to three minutes. Turn and brown the other side as well. Transfer to a paper towel-lined plate. While hot, season with salt and pepper. Preheat the oven to 250 degrees F. Using a food processor, grate the quartered potatoes and put them in the colander and sprinkle with two tablespoons of salt. Toss and drain for 10 minutes. Add the onion, egg, flour, baking powder, pepper, remaining one-half teaspoon of salt, and a tablespoon of corn oil to the food processor bowl. In batches, squeeze the liquid from the shredded potatoes. Put the potatoes in the food processor with the other ingredients and process for 10 seconds. Transfer the mixture to a large bowl. In a 10-inch skillet, heat one-eighth inch of the remaining oil over medium heat until the surface of the oil shimmers very slightly. With a soup spoon, carefully ladle four mounds of the potato mixture into the oil and spread them slightly until they are about three-and-a-half inches in diameter. Cook until the pancakes are a deep-golden color, for about two to three minutes. Turn them over and cook until the other side is also a deep-golden color. Transfer the pancakes to a paper towel-lined plate and sprinkle lightly with salt. Continue to add oil between batches as needed to maintain the one-eighth-inch level of the oil. Serve with the sour cream and applesauce on the side. Corn oil is extracted from corn and is used all over the world as cooking oil. It is also used in processed food and even as biodiesel. It contains both monounsaturated and polyunsaturated fats in small quantities, which are healthy for the heart. Although the oil does contain saturated fat, it is also found in small amounts. There are several potential benefits of corn oil, like lower cholesterol, improved heart health, maintenance of healthy skin, improvement of vision health, and lower high blood pressure. However, there are a few disadvantages of using corn oil as well, as it can lead to allergic reactions and toxicity of the liver, kidneys, and other organs. Moreover, many corn oil brands are made with GMO (genetically modified organism) ingredients, so it’s important to purchase non-GMO corn oil. You can make a variety of dishes using corn oil, such as fried corn cakes, okra corn cakes, and potato pancakes. Corn oil is grown in abundance and is relatively cheaper than other cooking oils, so it is also easy on your wallet. It is freely available to use in delicious and sumptuous food offerings, but due to the associated risks, corn oil should only be consumed in moderation. 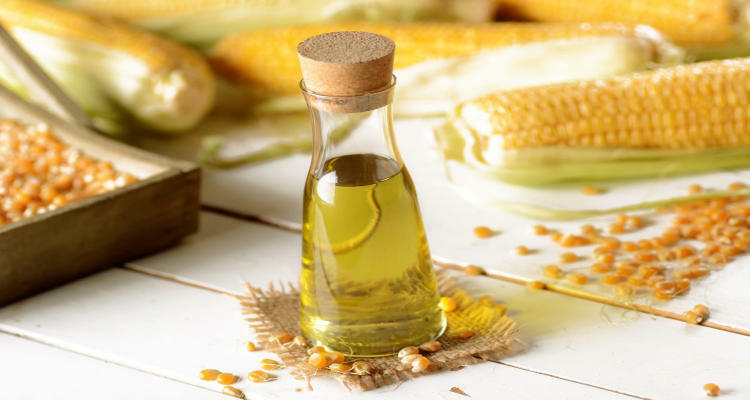 https://articles.mercola.com/herbal-oils/corn-oil.aspx, last accessed October 31, 2018.
https://oilhealthbenefits.com/corn-oil/, last accessed October 31, 2018.
https://www.eatthismuch.com/food/view/corn-oil,300/, last accessed October 31, 2018.
https://www.livestrong.com/article/527730-is-corn-fattening/, last accessed October 31, 2018.
https://www.huffingtonpost.in/entry/cooking-oils_us_5076730, last accessed October 31, 2018.
https://www.webmd.com/diet/news/20100119/corn-oil-used-most-often-french-fries, last accessed October 31, 2018.
https://www.organicfacts.net/health-benefits/oils/corn-oil.html, last accessed October 31, 2018.
https://www.stylecraze.com/articles/10-surprising-side-effects-corn/#gref, last accessed October 31, 2018.
https://www.livestrong.com/article/302830-health-risks-of-corn-oil/, last accessed October 31, 2018. Scarbrough, M., “Fried Corn Cakes,” fine Cooking, https://www.finecooking.com/recipe/buttery-black-eyed-pea-stew-with-fried-corn-cakes, last accessed October 31, 2018.
https://www.finecooking.com/recipe/okra-cornmeal-cakes, last accessed October 31, 2018.
https://www.finecooking.com/recipe/classic-potato-pancakes-latkes, last accessed October 31, 2018.
http://cornhubz.blogspot.com/2014/10/how-does-corn-oil-affect-liver.html, last accessed October 31, 2018.